In the first section of this series, we covered how to develop the “inner world” off-court for becoming a consistently strong and successful player on-court. Here, we’ll cover the “outer” or external things you can focus on to greatly enhance your game. 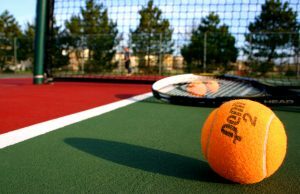 When practicing between matches, it’s tempting to exert yourself less intensely because there are no immediate stakes in the game. However, the seriousness with which you apply yourself in practice will translate directly to your performance in-game. Give 100% in every stroke, serve, and ball toss, and pay laser-like attention to your own performance, analyzing, adapting, and correcting, and you’ll have primed your mind and your body for automatically giving your all on court. Just as important as studying and refining your own tennis habits and skills is studying those of your opponent. Make sure to pay attention during a match to where both their weaknesses and strengths lie. One of the most useful things to gain an understanding of is your opponent’s timing. How long do they take to position themselves for their shot and to execute it? This will become one of your greatest sources of “intelligence” for throwing them off and securing points as you factor in their timing when setting up your own shot to throw them off. Perhaps the most straightforward but overlooked way to be prepared before you reach the court is to prepare your equipment and accessories. Make sure to check that your strings are tight and strong prior to a match, and tighten as needed. Your body is your most valuable form of equipment. Just as you need to keep your racquet tight and free from damage, your game will be affected by how well you take care of your body in between matches. And unlike your racquet, your body can thank you—with increased stamina, fewer injuries, better mental alertness, and tighter coordination. Take stock of what you’re putting into it and how much rest you’re getting in between matches. You’ll also want to steer clear of foods like milk, cheese, butter or pastries before a match. Instead, go for foods that won’t be heavy on your system like juices, fruits, yogurts with cereals, or toast. Before a match, it’s especially important to hydrate. Drink no less than 1.5 liters with electrolytes two hours before the match, and continue to hydrate throughout. It’s also wise to give yourself at least 15 minutes for a physical warm up before the match, and 20-30 minutes of technical warm up to get your mind and body focused and ready. This habit combines both physical and mental readiness. Almost all serious athletes have developed a ritual to enact before each game. The purpose of rituals is to lead yourself into a committed, competitive mental space that is fully present during the match—which in turn leads your body to heightened focus and readiness. If you have a set of warm-ups that work well for you, commit to a specific order and to doing them before each match. You can also add personalized actions such as listening to a certain song, looking in the mirror, visualizing the perfect match, or even drinking a certain flavor of electrolyte-enhanced water. Make it yours. If you are serious about taking your game to the next level, take the time to dedicate yourself both on and off the court. Your consistent mental and physical practice will definitely pay off.